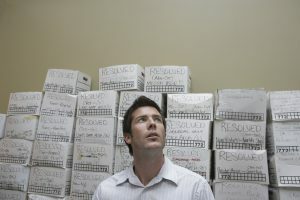 Before choosing what size unit you’ll need, make a list of all of the items you’ll be storing. Based on the list, you can determine the amount of space you will need. With proper packing and organization you can fit a lot more in a self-storage unit than may appear. Our friendly self-storage managers are also at your disposal to help you pick the right size unit, without selling you more space than you need. Not all storage units are created equal – especially when it comes to fire safety. Most of our self-storage facilities are all-concrete and/or metal. This all design provides added protection for your personal valuables and business documents while in. Organizing you unit in the beginning with easy access in mind will help you later on. Put pen to paper and create a floor plan for your personal storage unit. Tape a copy of your map on the wall of your self-storage unit for easy reference to all of your belongings. Store items you’ll need to access more frequently up-front. Stack your boxes along the wall from floor to ceiling with the heaviest boxes on the bottom to make a sturdy base. Create a clear path down the center of your unit, so you can easily access items stored in the back of your unit when needed. Our friendly Bargain Storage managers are waiting to answer all of your business storage questions. Let us help identify the best way to help you focus on what matters most – running your business. Give us a call today!